Weiner dogs get no glory. They are lumped into the “cute but you can’t do a lot with them” category with other small dogs. Part of this notion is due to their propensity for back injury. Most of what I have read says that a dachshunds tendency to develop back problems in mostly influenced by genetics. People are afraid to let their dogs be too active in fear that it will increase the chance of back problems. This blog is here not only to prove that stereotype wrong. More and more people are speaking out about the need to keep your dog’s weight down and help your dog stay active to develop strong, supportive muscles to support their spine and help keep back problems at bay. 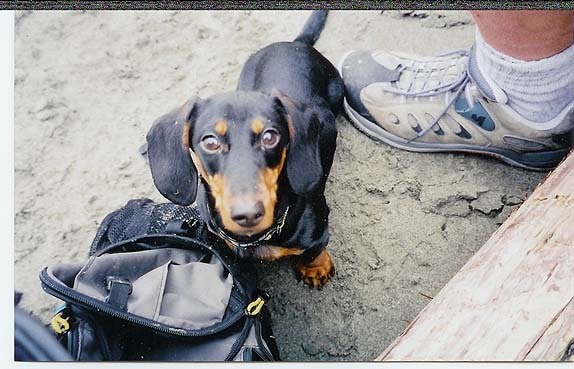 We share our stories to prove to the world that Miniature Dachshunds make great outdoor adventure buddies and are a great breed for anyone looking for a big dog in a small package. They love hiking and it is a great way to keep them fit and strong. When recounting our adventures to friends, the phrase we hear most often when we tell them we took our Miniature Dachshunds with us is “You did what with your weiner?”. They are amazed at what these little dogs can do. You can follow the adventures of Chester, Gretel and their humans here on the You Did What With Your Weiner Blog. Check back often for updates, photos and adventure stories. We would also love to hear from you. If you hike with your weiner dog we want to hear your story. We may choose to feature you as a guest Adventureweiner on our blog. We also appreciate feedback and comments on our blog post. I just LOVED reading your blog spot! I will be back to visit and learn more about your wonderful adventures! Hike on! Thanks Lauren! I plan to post at least once a week. I will also be posting some guest weiners too. I am glad you found us Bruce! We love sharing our stories and getting the word out about these great little dogs. Love your blog. Weiners can do anything! Dachshund Luke flew with us from Florida to Spain and has been enjoying running around on the mountain paths. Soon he will be flying back to Florida to enjoy the sunshine. We check out your blog all of the time too. It’s on our favorites! Great reminder. Wieners are so cute and cuddly that we forget they were designed to go after vermin and badgers, one of the more rugged and wild animals one can encounter. Brave little go getters who love to be out and about!